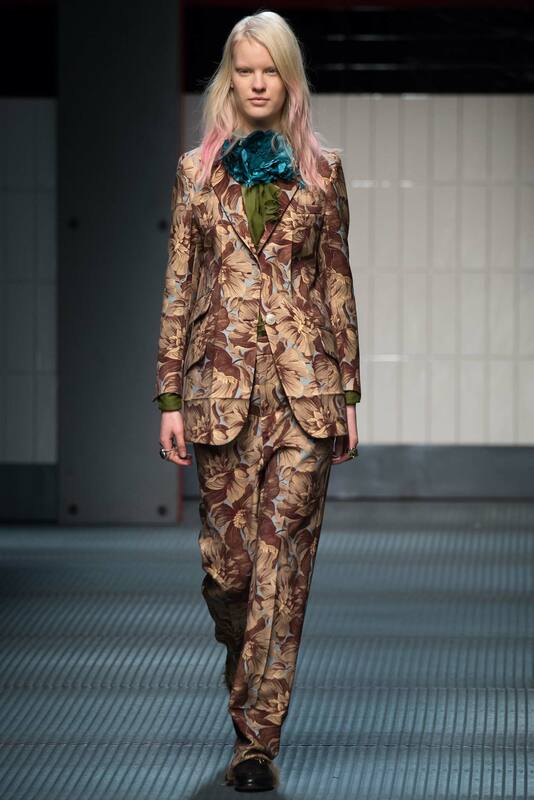 In the never ending series of fashion musical chairs, Frida Giannini is OUT (after an 8 year tenure), and Alessandro Michele (former head accessory designer at Gucci) is IN as the new maestro at Gucci. 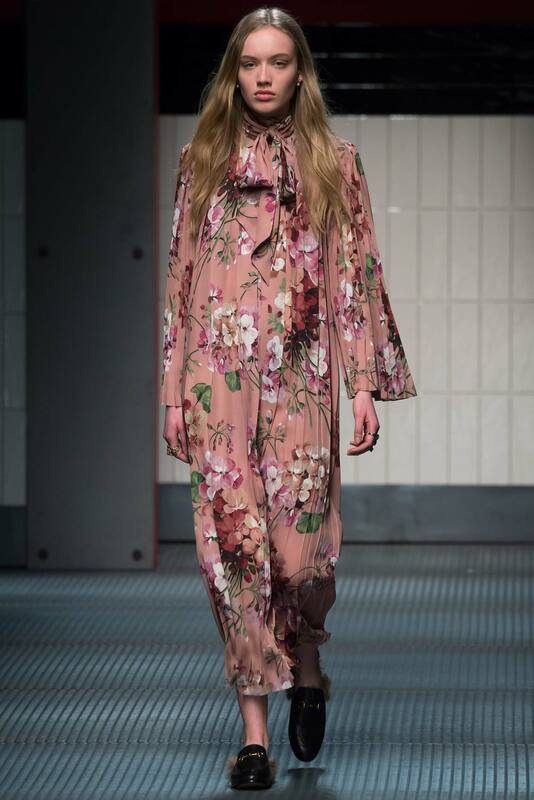 I for one loved the Giannini aesthetic of mod, pared down, and feminine fare which harkened back to 60's and 70's chic. Clothing which conjures the essence of Jackie-0 or Nancy Sinatra in her go-go boots is always a good thing. I don't know the gory details, but I'm assuming a bean counter got his knickers in a twist about whatever. When first perusing the fledgling fall winter collection of Michele my hackles went up a bit at the seemingly helter skelter assembly of pieces, but after several subsequent viewings, I happily embraced the commingling of disparate themes and eras manifested by flowy boho-y frocks, loose fitting man suits, minis, midis, feminine florals and glittery geometrics, in a vibrant and varied color palette that would certainly stave off ennui while infusing a joie de vivre attitude not always captured in the shows. Ruffles and bows are rife in this collection I'm happy to say, adding a girly girl vibe without being cloying or saccharin. Remember, a well placed bow or ruffle can feminize a more conservative or severe ensemble. Black is kept to a dull roar in this collection, thank heavens. I mean I love black as much as the next gal, it slims and covers a host of unsavory flaws, but not all black all the time. Dear Lord, bring on the COLOR! 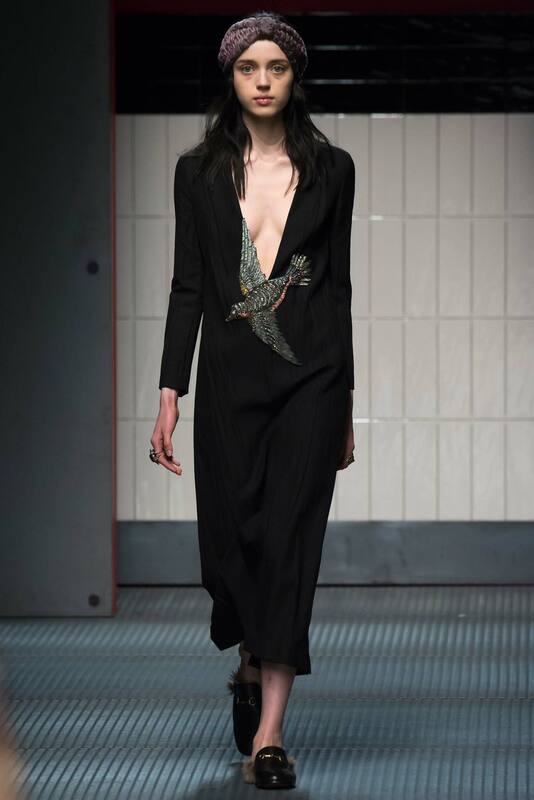 And if black is all you know, this collection is a good one to lift you from the Morticia Adams abyss. Dip your toe into the pool with a teal blouse or a red military inspired wool coat. Give your optic cortex some stimulation from time to time. Clearly Michele is not a slave to rules or obsessive compulsive disorder, on a quest for the "cohesive" collection. Y A W N. Who started that tiresome concern? Gawd, who gives a crap? I love a collection with a medley of ideas, fabrics, and colors that will provide fodder for every fashionista's closet. These are happy clothes which will put a smile on your face. (And if not, it might be time to consult your local pharmacist). Ok, I would suggest a more opaque top, but never mind that. This red leather midi skirt is a piece for the ages, a fall winter staple to be worn with all version of boot (or shoe bootie). Would be fab with a T-shirt or cropped sweater. Everyone needs some RED in their fashion repertoire. I'm loving this piece more everyday. 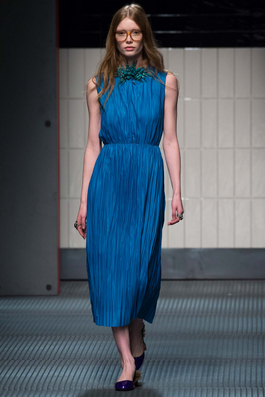 Brings to mind Marni, without being clearly derivative, feminine with casual whimsy. 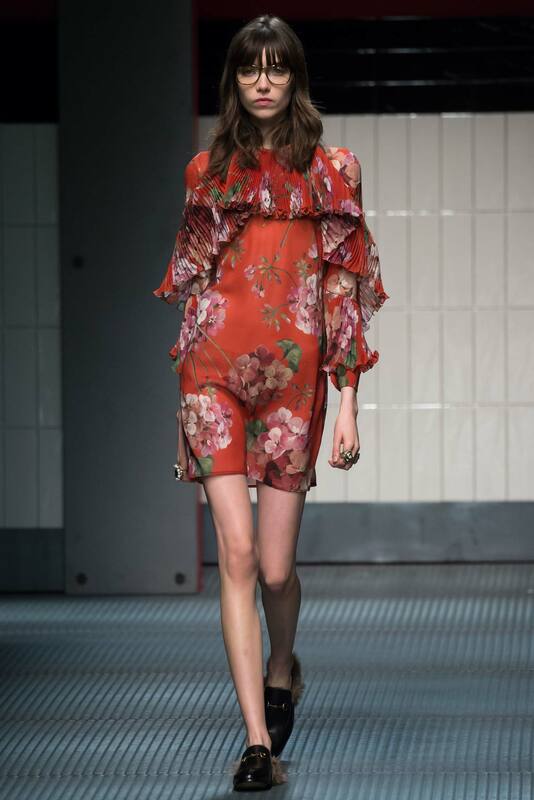 The clothes are sweet and fanciful without being too over the top or overwrought. And who doesn't love the well placed bow? 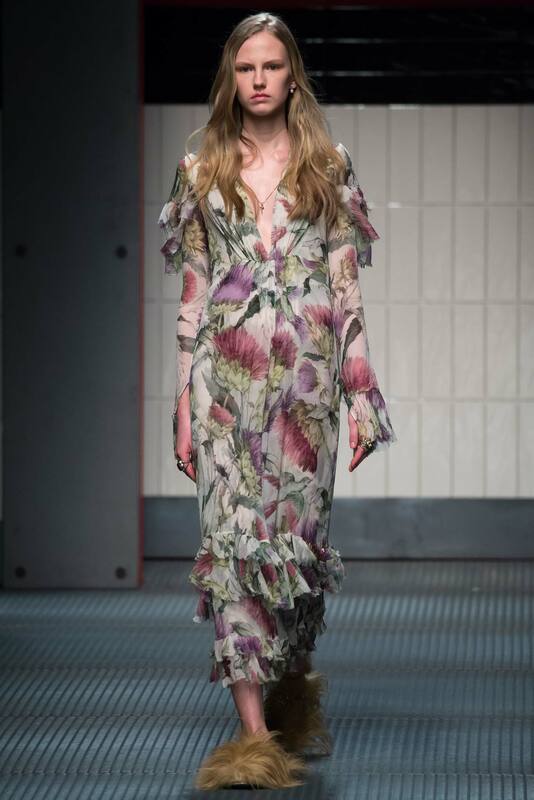 Boho-frock and Cousin It shoes? Why not? How is THAT for cohesive? (Pffft). Perfect for spring sojourns and Indian summers. Another festive kicky floral, to worn as a dress or tunic. I'd wear with Charlotte Olympia flats OR some patent leather stilettos in a contrasting color. Think Robin's egg blue. Again, mini or tunic. Love the taupe lace, sweet and alluring. And for any of the sunworshipping yacht hopping crew, this would be a great bathing suit topper. 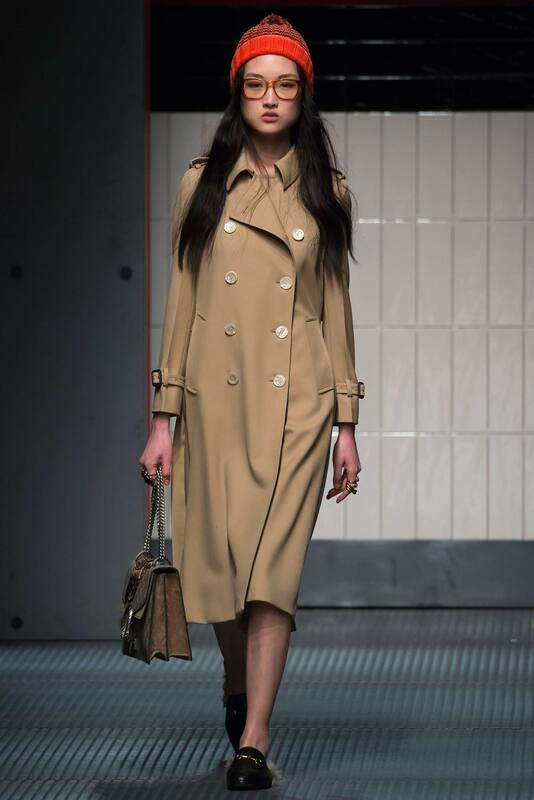 Into most fall winter collations, a trench must fall. 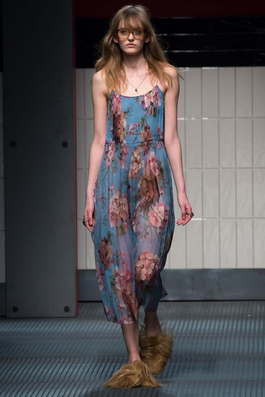 This flowy casual entry is a welcome contrast form the more typical and prevalent structured variety, ala Burberry. This is the perfect layering piece for traveling. 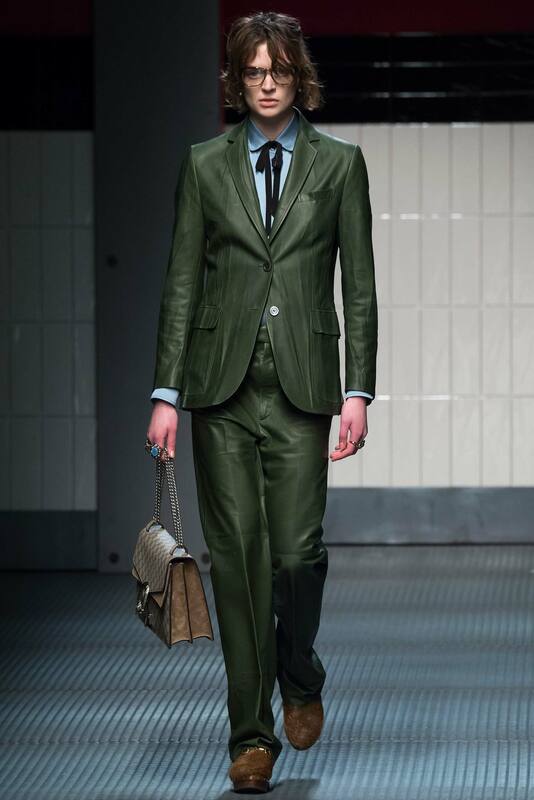 Can be thrown over one of the marvelous suits in this collection, or whatever. (Loving those fuzzy clogs with the iconic GG detail). 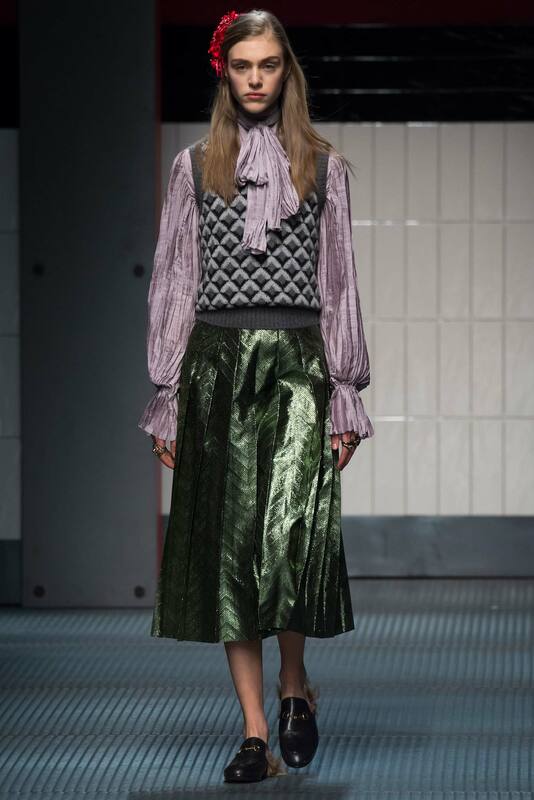 The full on leather ensemble may be a bridge to far, but the green leather pants with some platform shoe booties and one of the silk blouses in the collection would be sizzling chic. 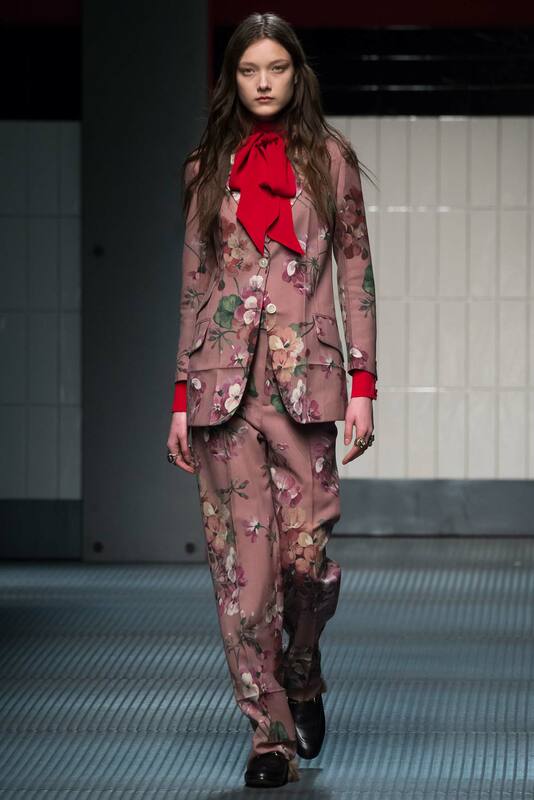 The bright red bow adds even MORE visual interest to this winsome mauve floral suit. Schoolmarm goes to the disco. The MIDI is back! 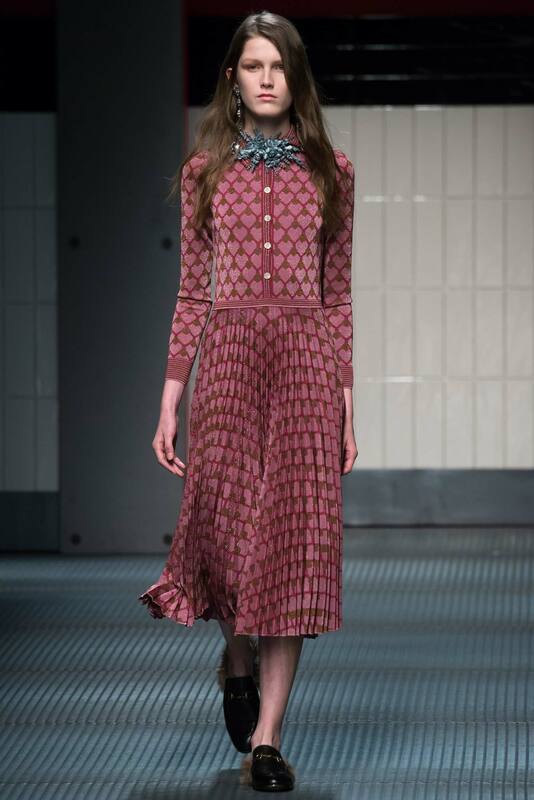 I haven't seen anything quite like these dresses in the fall winter collections, but I am obsessed with the glitterized geometric prints admixed with the pink. Sort of Mad Men, sort of 70's……. 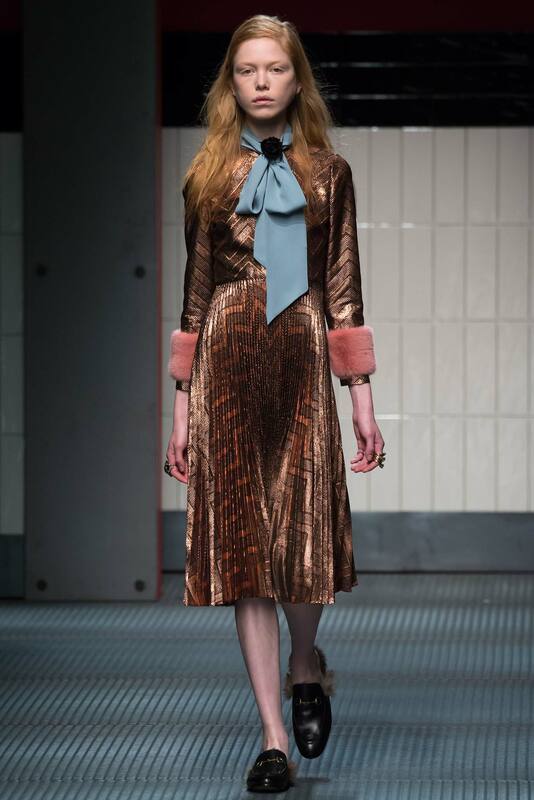 Love the juxtaposition of leather and lace (always a winning combo) and 60's mod geometric print with the orange sherbet bow. Ok FINALLY some black! But at least we have the VA-VA-VOOM plunging neckline with the embellished ornithological addition to stave off a bout of narcolepsy. Yowsa! 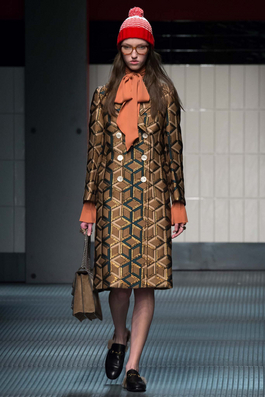 I'm curiously mesmerized by the lose man blazer over the midi skirt, with a nonchalant Annie Hall ease. The longish blazer is a perfect companion to cuffed slacks, skinny jeans, or hell, even an A-line leather skirt. 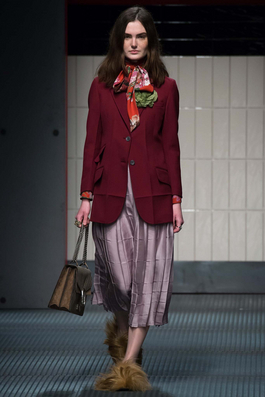 Anything can be jazzed up with a big flamboyant scarf (if in doubt, with sequins). KABOOM! 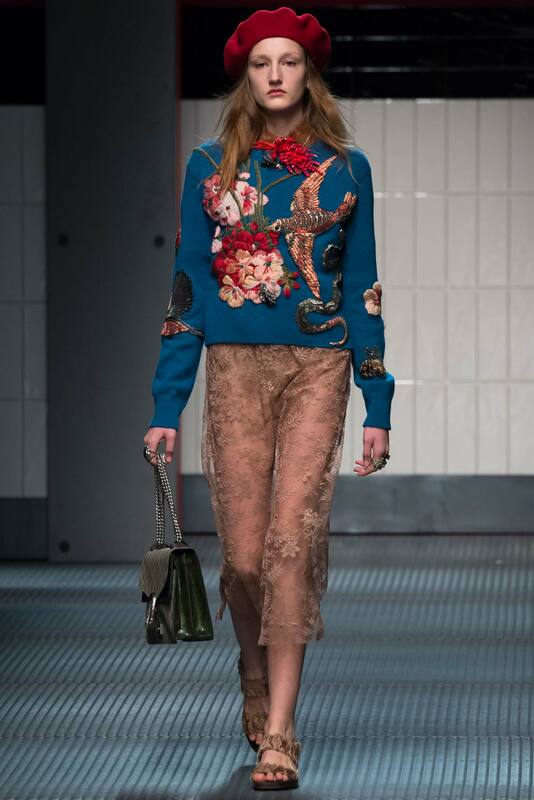 T H E most eye-popping spectacular sweater on the runways. This would pair with anything, including the red leather midi, skinny jeans, or a pleated mini. (Who needs both kidneys?). Like the folks at Project Runway often exclaim, I am excited to see what else Michele has in store!!! !